I spent some time at the weekend upgrading the look and feel of my website. My aim was twofold: First, a kind of spring cleaning, aimed at de-cluttering the site and focusing the experience primarily on the articles, rather than myriad sidebar links. I have come to realise it is not so much reading on screen, as reading on a screen full of other options, that I find distracting and therefore distressing. Hopefully, in this sense, the new site mimics the experience of a print publication just that much more. Second, I wanted to make my site more mobile-friendly. I extended the forthcoming and much-anticipated WordPress TwentyTwelve theme (still in alpha) with touch-friendly features such as a button-like top navigation menu and larger search box. 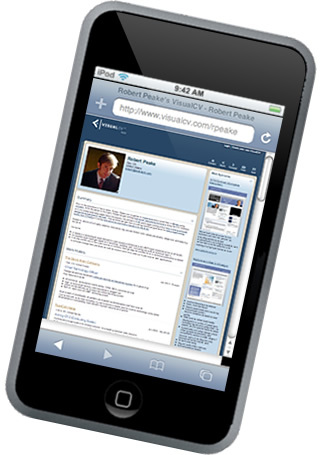 The site also adapts based on screen size to avoid having to zoom and swipe around when reading on a small screen. Although I typically have only upgraded my site every couple of years, it felt important and appropriate to serve a growing mobile readership with a better experience, and everyone else with what I hope to be a more elegant and visually-appealing presenation of my writing. What do you think? The site may well have a few kinks to iron out (let me know if you find any). For those interested, you can also view past site designs, dating back to 1999. Living in two worlds can require a lot of explaining. When poets and poetry aficionados ask me what I do for a living, I usually just say, “technology.” Often, that one word is enough to make them change the subject. Most people don’t want to know the details once I utter the t-word. You’d think I worked in a slaughterhouse. But even for the tech-savvy, an elevator pitch or traditional resume doesn’t really begin to tell the full story of what I do. That’s why, when I discovered VisualCV through Guy Kawasaki’s blog some months ago, it seemed like the perfect way to explain what I do, in a more rich and compelling way, to technologists and poets alike. I added screenshots of websites, narratives with hyperlinks, technical articles, and video to my VisualCV page using their super-easy, web-based interface. Then, I posted a link to my VisualCV page in the community forums, thus entering myself in to the VisualCV best resume contest. A few weeks later, I got notice that I made the finals. My wife, Valerie, whose career story is equally complex and compelling, actually did as well. They generously issued Amazon gift certificates to both of us. I used mine to buy books for my final semester of the MFA. Then, a few weeks later, during my fourth MFA residency, I got notice that I won one of the grand prizes for best resume. How cool is that? My prize, an 8GB iPod Touch, arrived yesterday. It’s basically all the fun of an iPhone without those annoying cell phone features. I have nicknamed it the iFaux. Say it fast, while holding it up to your ear, and nobody will know the difference. Big thanks to VisualCV for both a great application and a fun new toy. The Academy Of American Poets recently announced their mobile poetry website, complete with numerous poems arranged by theme or occasion and by form. 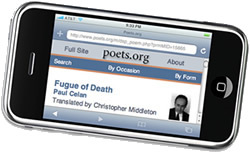 Now, if anyone accuses you of being shallow, you can call up Paul Celan’s “Fugue of Death” on your iPhone, recite a few lines, and quickly prove them wrong.